When in London, the salad bar as cocktail. Inspired. Pearl Restaurant & Bar in High Holborn, London, has recreated the salad bar in liquid form. The venue’s head mixologist Anthony Balik has worked with its head chef, Jun Tanaka, to transform classic salads into cocktails. The Waldorf is a mix of home-infused walnut vodka, muddled with celery, pressed apples and grapes. The cocktail is served with an accompaniment of grape jelly, walnuts and celery sticks. Reinventing the Greek salad is a creation based on Gin Mare, a gin infused with Mediterranean botanicals, mixed with tomato consommé, fresh tomato and cucumber ice cubes. It arrives accompanied by a salad of feta and olives. Offering a more exotic, oriental twist, The Thai is made from chilli-infused cachaça, fresh mango, papaya, lime and palm sugar syrup. 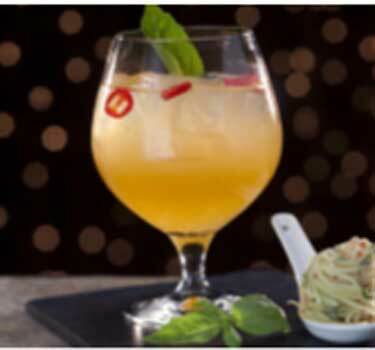 The cocktail is served with a Thai noodle salad and crushed peanuts. The Salad Bar menu will be available until 30 September, with each cocktail priced at £13.75, including its side salad.